There's no such thing as a single secret...The brand new novel from the NEW YORK TIMES bestselling author of HEART OF THE MATTER. Marian's biological clock is ticking. She has a dream job as the producer of a hugely successful TV show, a stunning Manhattan apartment and a wonderful relationship with the man she loves. But she wants a baby - and she also has a secret. And when that secret turns up on her doorstep after 18 years, her picture perfect existence begins to take on a life of its own. Kirby is adopted. She loves her parents and her sister, but she's never really felt she fitted in. And now she's 18 there's nothing to stop her finding her birth mother. But navigating her way, alone, to New York is only the start - and as Marian soon discovers, giving birth is the easy part. There's no such thing as a single secret... the brand new novel from the New York Times bestselling author of Heart of the Matter. Im sooo disapointed by this book. I loved all the other emily griffin books, but this one, I struggled just finishing. Firstly, Its sooo predictable, I knew exactly what would happen to the main character as I started reading. Its hard to feel emotionally connected to the characters, because they are one dimentional. Myriam is a typical New york workaholic snob who loves to shop at barneys, yawnnn. Kirby is a typical teenager who loves music, and is unsure of herself and trying to figure out what to do with her life. I did not feel myself wanting to flip the pages of the book, and trying to find out what would happen. MEhh, wouldnt recommend, its another 3 hours ill never get back. I read this book the first time and thought it was boring. I don't know what was different about this time, but clearly SOMETHING was. The words she wrote were the same, but this time I felt what was going on in my gut. It was so real. It's so tempting to expect an adoption story to end with everyone one big happy family or the complete opposite--everyone coming away from the meeting with nothing in common and no desire to be part of each others' lives. I think I read one of the earlier reviews as saying that the book provided a negative look at adoption. I didn't see it that way at all. Kirby got what she needed, and Marian and Conrad as the adults figured out their lives the best way they could. However, I do wish Marian had been honest with Conrad at the beginning. It was an ok book. Definitely disappointed in the end of the book. Seemed like the author just wanted to be done with it maybe to make her deadline with her publisher. Book tended to spend most of the time on Marian, yet I didn't get a good read on who she was as a person. More of a superficial instead of an in-depth look of her. There were some good insights to how some adopted children feel yet again superficial. For the most part all characters were one dimensional. 4.0 out of 5 starsWhere We're Meant to Be? 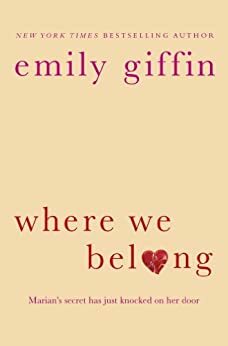 "Where We Belong" is a story about decisions and consequences, and how the choices that we make not only affect ourselves but others as well. Marian a rich teenager was used to having her own way in everything, and didn't really think about how any of her actions may affect others. While Marian was still in high school, she became pregnant by Conrad, a teenage musician friend. She hinted to him that she might be carrying his unborn child. Conrad was not exactly overjoyed when he heard about this, but made it very clear to Marian, that not only would he stand by her, but he would also take an active role in caring for their child. Marian decided then and there, that she had to keep her pregnancy a secret. Conrad she knew, would want her to keep the baby, and she just couldn't do that. So she broke up with him. Her parents would never have approved of Conrad anyway, she rationalized. He was a musician who was going no-where, and she had college to attend, a career to find, and a successful man to capture, before she settled down. There was no room in her life for a stagnate husband and a new born baby; no, no room at all. So Marian secretly birthed their child and gave their daughter up for adoption. Eighteen years later Marian's lie of omission came knocking at her door. Her daughter Kirby, was now a teenager and she wanted answers. Kirby always knew that she had been adopted, and for the most part, she was fine with that. But Kirby never felt like she really fit anywhere, and she wanted to know why. She wanted to know about her birth parents. To all outward appearances, Marian appeared to have the perfect life. She was a successful TV producer who lived in a fancy upscale apartment, and had a rich handsome boyfriend by her side. But she wasn't happy, there was something missing in her life. Of course Marian's answer to her fulfillment was standing right at her doorstep, but she didn't know that yet. There wasn't an immediate bonding with Marian and her daughter Kirby, which made the author's writing of their first meeting realistic. Kirby was the typical teenager, melodramatic, irritable and quite often rude. And Marian, well…she was the shell-shocked Mother, who was trying desperately to hide from everyone, her sin. The two of them did end up bonding, but not before suffering some emotional bruises from each another. Kirby as anyone can imagine wasn't exactly throwing out warm fuzzies to her new found Mother, and Marian was quickly discovering with dismay that there were no easy "do overs" in life. And that sometimes the words "I'm sorry" just weren't enough. 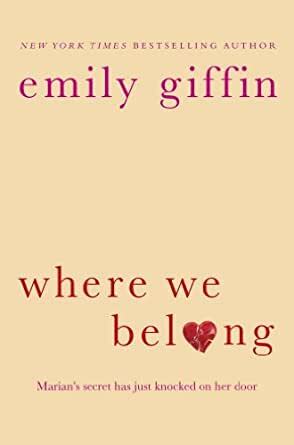 This book stirred up strong emotions from Emily Giffin's readers. I personally liked it. I didn't care for the heroine, but I don't think I was supposed to. She was an entitled rich girl who was used to getting whatever she wanted without taking into consideration other people's feelings. She did change for the better though, when she discovered that what she really wanted, money couldn't buy. Forgiveness she found came slowly, like the pealing of an onion, one thin layer at a time. It wasn't something that she could rush, buy or take. It had to be given freely, and Marian decided, more than anything, that she wanted it. I really liked Conrad and wished that he had played a greater role in this book. He was as well as the ending, a total surprise. I agree with many of the readers who felt that the ending of the book was too abrupt and that it would have benefitted greatly from a few added chapters. But then again, maybe the author is planning a sequel. A reader can only hope. All in all, I enjoyed the book and would recommend giving it a read. I think Emily Giffin did a fabulous job with her character development, and unique storyline.